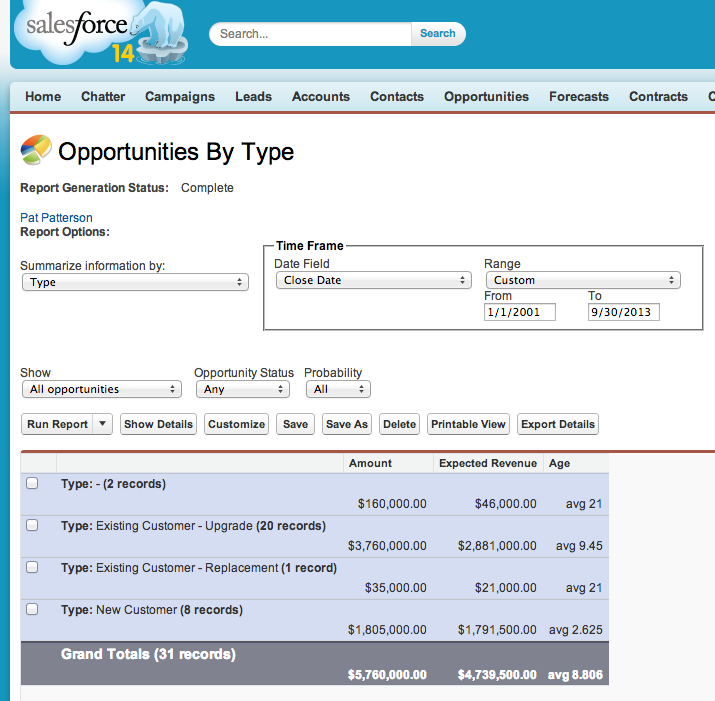 Salesforce Developer Evangelist alumnus Ron Hess asked me this question a few days ago: “I love the new Analytics API! 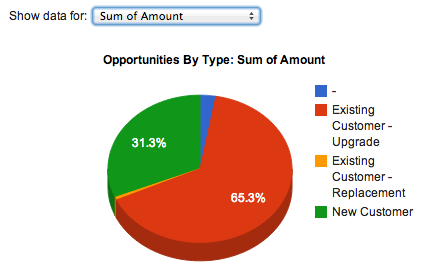 I want to pull the data into a Visualforce Page (or Apex Class). Can I use ForceTK to do this? Can I access the Analytics REST API using the proxy?“. That’s a great question, but before I go ahead and explain the answer, I’d better explain the question, for folks that might be scratching their heads at the mention of ForceTK and proxies. The Analytics REST API itself is new in the Winter ’14 release, and it’s worth mentioning that the longer term plan is to provide similar functionality in an Apex API, in the same way that the Chatter REST API preceded Chatter in Apex. Having said that, though, right now, the Analytics REST API is the only supported mechanism for loading Report data, so we’ll go ahead and work with it. 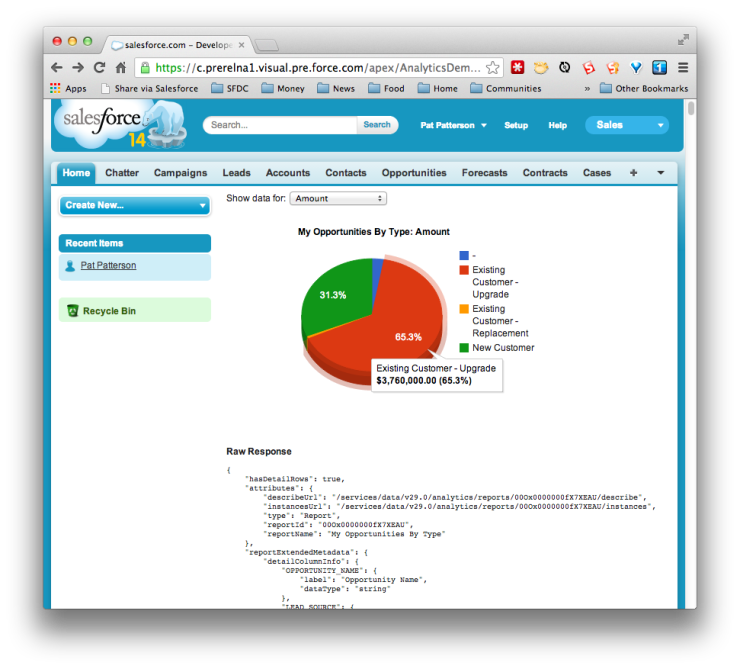 Now we’re all on the same page, let’s look at how you’d use the Analytics API on a Visualforce Page to pull Report data from Salesforce so you can show a custom visualization using Google Charts. I’ll walk through the code highlights in this blog entry, but you can grab the entire file here. Skipping down to the $(document).ready() handler, the first thing we do is read a Report ID from a query parameter. Passing reportId to the page makes it much more versatile. In the anonymous callback, the first thing we do is save the report data in the report variable, then write it to a <pre> element on the page. You wouldn’t do this in production, but it’s essential for development – you really want to be able to see the raw report data. Once the library has loaded, we can extract labels for the grouping and aggregate columns. The first entry in the data array that we pass to the Google Charts library has to contain metadata, rather than the data itself, even though it’s not shown on the pie chart. Still, we populate the array with the actual labels, rather than dummy strings, in case we want to reuse the code in a different context. prefix: '$' // This is just sample code - should really determine the correct currency symbol!